A few days ago, we reported minor signs of Google Algorithm update, but things got settled in few moments. However, yesterday we again witnessed some gigantic signs of an update. The Webmasters got a bit excited and started a new discussion at Webmaster forum. This time the energy was at its peak because lots of webmasters were confident about the update. The Update news was so busy that even lots of people started to tweet the news on Twitter. I Guess Google Again started to Love me, ♥ Alhamdulillah. P.S: There is no official confirmation about the update. Let’s wait and see what’s happens. 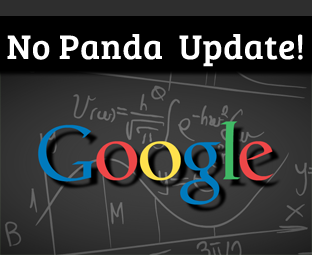 Everyone would be shattered to hear that Google has officially declined that there was neither Panda nor any other kind of Algorithm update. Google has informed that there was no Update. Here is their comment. It is not Panda. We asked around a little bit and did not uncover any other likely suspects, but remember that Google launches over 500 algorithmic changes per year, so there are always small changes rolling out. It’s not the first time when Google has declined from confirming the update. What would be the reason of hiding Algo changes from the webmasters? I guess they are inventing some more deadly animals to hurt the webmasters with more penalization. None the less, those bloggers who had their heart in their mouth would be relieved. Now only the time would tell that whether Google was saying the truth, or they are hiding something from the webmasters. Since, Mozcast, SERPs.com and SERPmetrics have not updated their graph. Therefore, we cannot tell argue more until we have the evidence about it. Believe it or not, there was no Algorithm update. This means, Party is over guys get back to work and start concentrating on your content. Try to build more professional content and try to avoid content plagiarism. I can sense that lots of bloggers would be relieved because they are always afraid of Algorithm updates. If this time Google has declined to accept about the algorithm update. However, believe it or not within few weeks they will roll out some minor changes in their algorithm and would label it as an update. That’s how they always do. What are your thoughts about this Statement of Google? Feel free to leave your comments. I think they are denying it and again they will release the update . If Google didn't update any algorithm so why my site ranking is down? anyone guide me..
Google Always Hide these fluctuation. The Blogosphere knows that it was an update but Google has declined it. We can't do anything in that. Yup, They always play around bushes. I Think Google would Repeat the History. They always do like that. Yes MBL is always active about this updates that's why it is unique . Awesome Article About Google Panda.